Five-year-old Grace seems tired. After all, it’s her first day of class. While the instructor reviews last week’s lessons, at which Grace was not present, Grace sits down. When the instructor describes what they’ll be doing that day in class, Grace lies down and falls asleep. Of course, Grace is a black Labrador retriever, so no one reprimands her. Grace and the two other dogs in class — a King Charles Cavalier spaniel named Magnus and a yellow Labrador retriever named Oliver who goes by Ollie — are part of A Fair Shake for Youth. 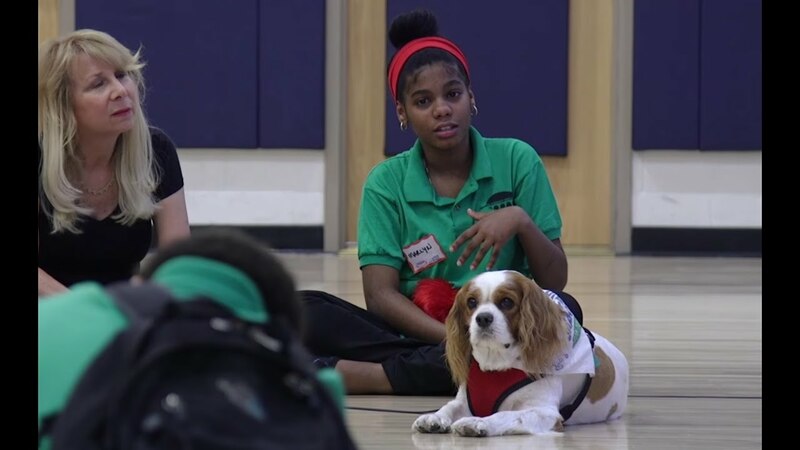 A nonprofit that brings therapy dogs into schools, particularly schools in low-income neighborhoods that receive additional federal funding, A Fair Shake for Youth uses dogs like Grace, Magnus and Ollie to teach students empathy and social skills that will help them in and out of the classroom. The group was founded in 2010 by Audrey Hendler, who previously had been bringing therapy dogs into prisons through Puppies Behind Bars. She realized, “Why wait?” when there was opportunity for dogs to make a positive emotional impact on children before they have a chance to become incarcerated. At the Highbridge Green School, an academically struggling middle school in the Bronx, the 2015–16 school year was the first year A Fair Shake For Youth had a presence. A handful of the students seem more wary, and when it comes time to teach Grace and the others to “sit” and “stay,” their voices are barely audible. They are hesitant to pet the dogs. Hendler chose to work with middle school students because, as she said, it’s such a critical age in social and emotional development. Hendler also focused specifically on high-poverty schools and students from struggling neighborhoods. Working with the dogs improves how the students, many from unstable backgrounds, feel about themselves, she said. Alexandra Horowitz, a professor of psychology at Barnard College who has studied and written extensively on the subject of canine cognition and dog behavior, confirms the soothing effects dogs can have. Hendler says the students can draw connections between the dogs and themselves. For example, if a dog is acting nervous, students work to make it more comfortable. Understanding how to soothe emotions in another being can allow them to apply what they learned to themselves and improve their interactions with their peers, she said. The 74 returned to Highbridge middle school a month later, and the difference in the students and their encounters with the dogs was palpable. Jermaine Jackson, 13, said he saw a change in his classmates who used to be scared of dogs, and working with Grace, Magnus and Ollie helped him change how he interacted with his classmates. 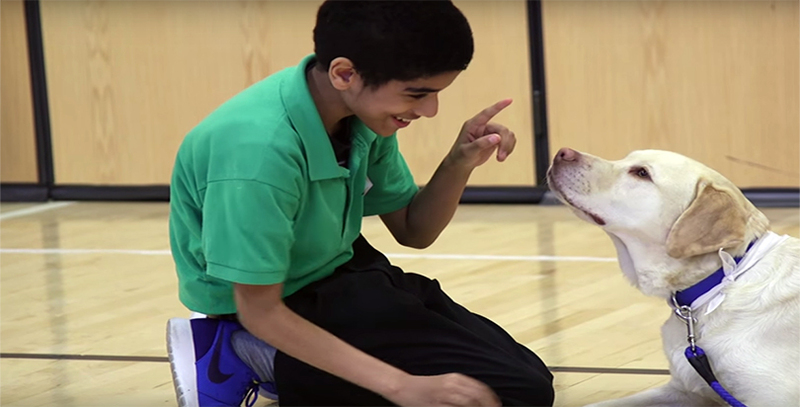 “[The teachers] said dogs are treated how you want to be treated, so if you treat a dog nice they listen and hear you. It helps with my classmates too,” he said. For Marlyn Delciuc, 12, working with Magnus — a smaller dog — helped her overcome her fear of dogs and also work on her own attention and reaction issues. “I learned how to control myself,” she says. Realizing it would be the last day she’d get to see Magnus for the semester, Delciuc started to cry and went to say goodbye one last time. Magnus, ever the therapy dog, wagged his tail as she petted him, soothing her sadness at their parting.